The colorful, tiled wall outside Fraser Centre in downtown State College contains 409 colored tiles, each representing a school the Penn State football team defeated during Joe Paterno’s head coaching career. 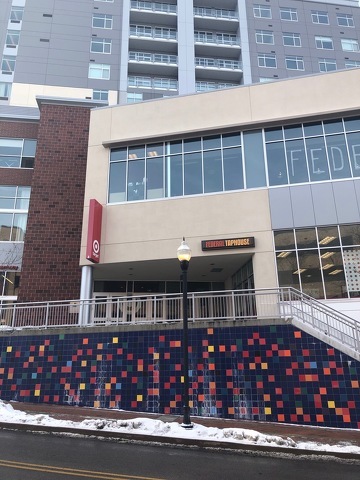 STATE COLLEGE — Ever since the Fraser Centre opened in downtown State College in 2016, rumors have quietly swirled about the colorful tile wall that runs along the Fraser Street side of the 13-story building, beneath the entrance to Target and Federal Taphouse. While there appears to be no obvious rhyme or reason to the haphazard multicolored design, it turns out that there is indeed something to the rumors, according to Gary Brandeis, one of the building’s co-developers and president of Real Estate Capital Management in Ardmore. Brandeis, a 1988 graduate of Penn State’s Smeal College of Business, held a brainstorming session with his architect to come up with an idea for some artwork that might be appropriate. Great care was taken to ensure that each square tile matches its represented team’s official color as closely as possible, Brandeis said. “There’s a Syracuse orange for each time the team beat Syracuse, crimson for the times they beat Alabama, and so forth,” he said.